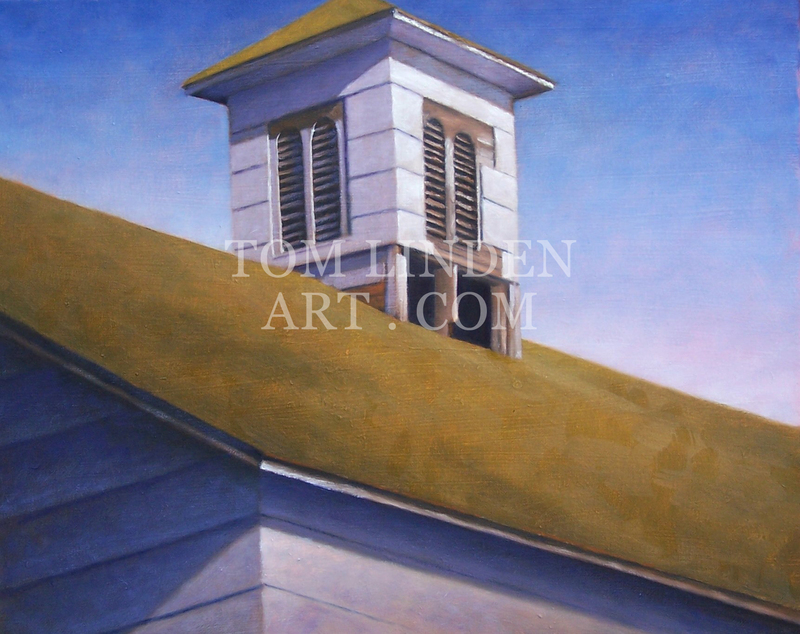 Thrilled to share news that my painting, Clouds Over Grange Hall 3, was awarded First Place at The Regional Survey of Art 14 sponsored by The Next Picture Show, Dixon, IL. This work is a meld of two sketches. 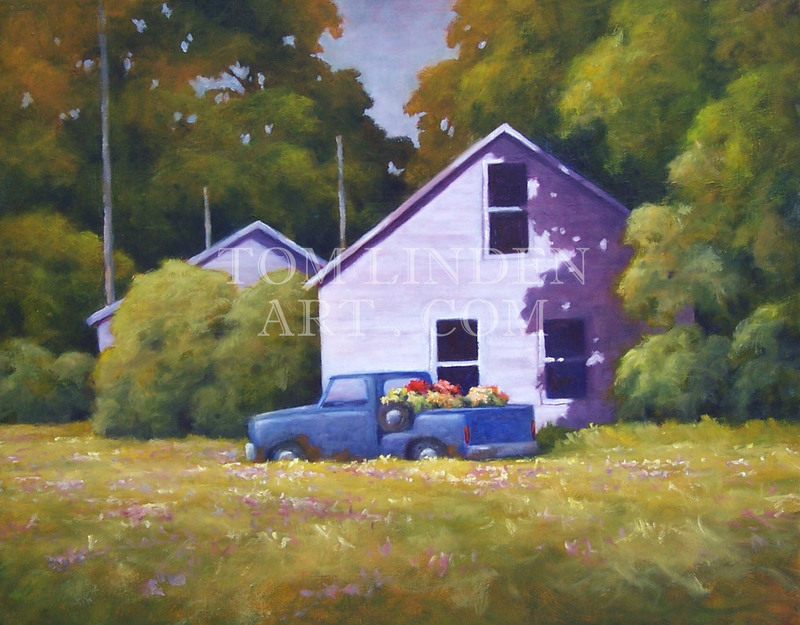 I have created several paintings of this farm. I have created paintings of the different buildings and have created a couple “longscapes” which capture the feeling of the land. I though that it would be fun to take this farm and place it in the presence of a very dominant sky. I grabbed a couple sketches and photos from a sky I witnessed earlier and merged them with this farm. I guess it worked. (The preliminary design sketch, 20″ x 16″ is also available). 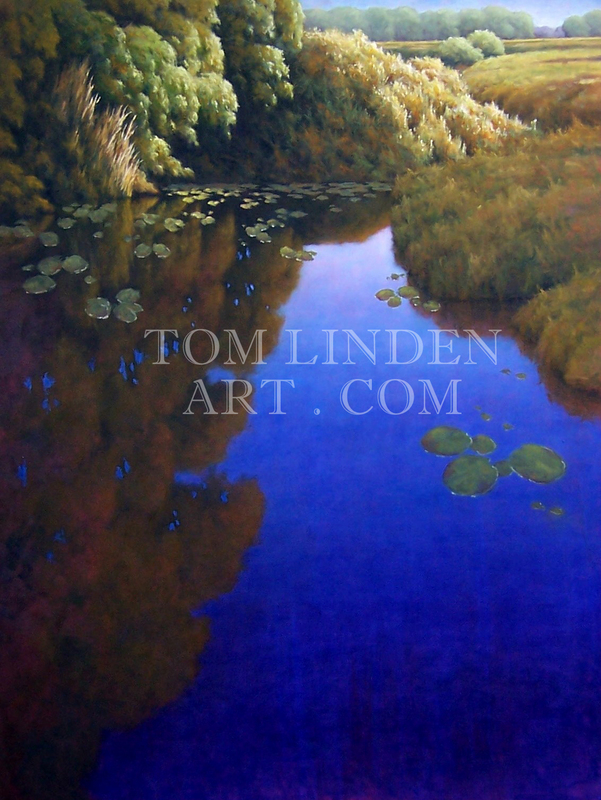 Happy to share the news that my painting, Olson Over Flow, was granted First Place at the Regional Survey of Art 11. The works are on display at The Next Picture Show, Dixon Illinois, through February 21. 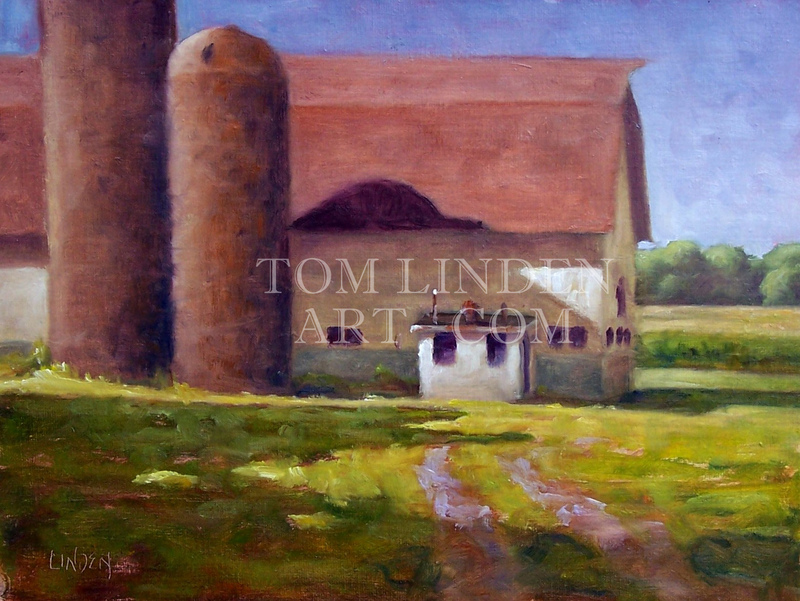 I am honored to report that three of my submissions have been accepted into the Farms and Barns 9 Regional Competition. Barn Overseer, Klenke’s Florals and Barn at Indian Hill – Plein Air will be in this exhibition at The Next Picture Show in Dixon Illinois. The exhibition opening and awards ceremony will be September 14. The exhibition runs through October 15, 2013. Rain for the morning, predicted to be sunny by the afternoon. Let’s try one more work for the Raw and Cooked. I did not want to get in a rut and use all the baking items again. 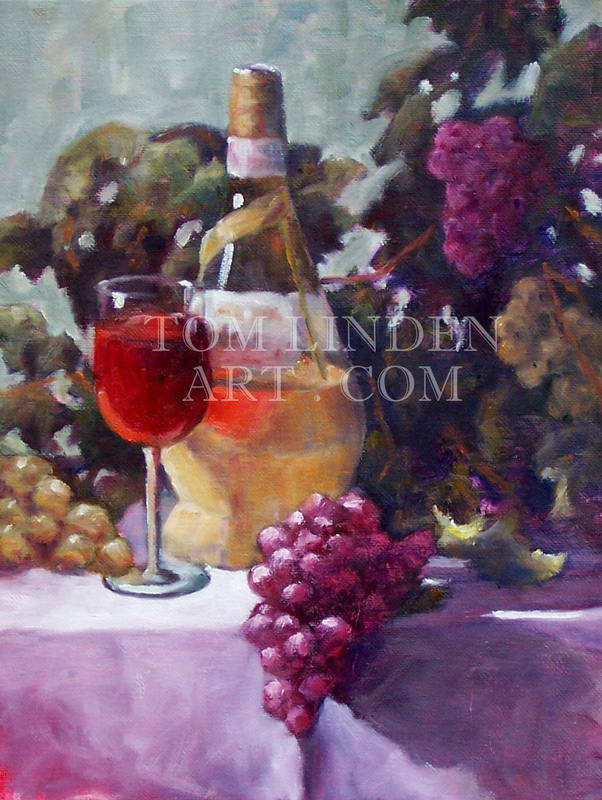 Liked the idea of the wine bottle and grapes. thought that this might be a stretch for acceptance, but I had to try. Took me a little longer than perhaps it should have. I wrestled with the grapes and the wicker on the bottle. I waited until the end to actually poor the wine into the class. 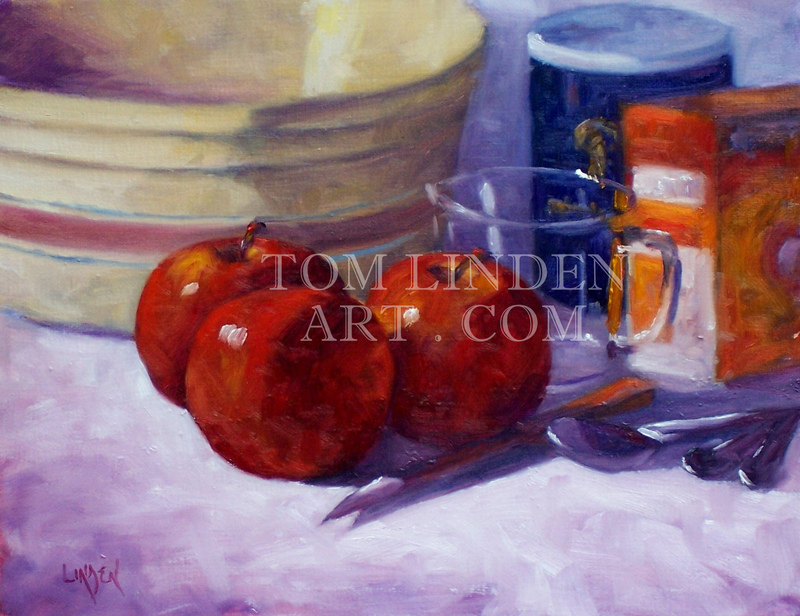 Thank goodness for oils as I had numerous adjustments to make due to changes which occurred. Still fun to paint. Happy to report that this work is also accepted to the Raw & Cooked exhibition at The Next Picture Show August 2 – September 4. Since I am inside, I shall tackle another work for the Raw and Cooked Competition at The Next Picture Show in Dixon. I had some banana bread with my breakfast. Thought that might make a good subject for the next painting. As soon as I put the bananas next to the reflective mixing bowl, I knew I had the set up. No need to tackle the actual bread in this one. Let the title carry the message. 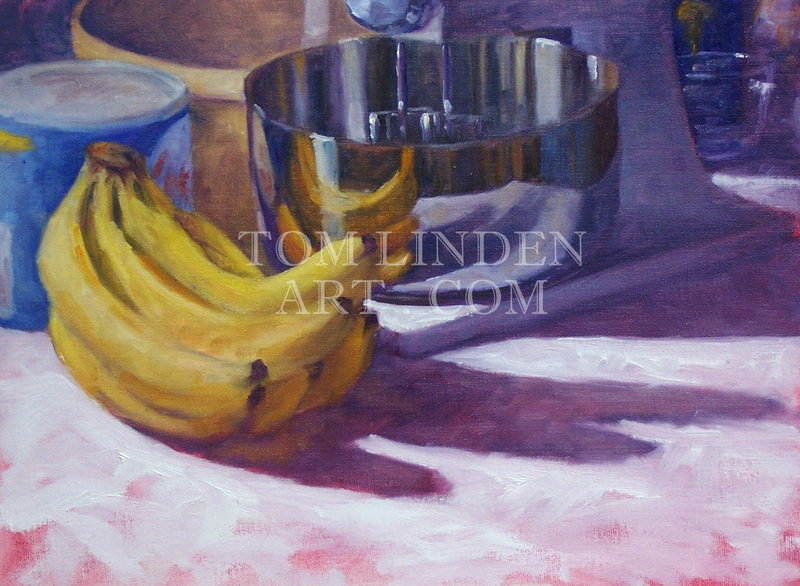 The reflections in the bowl were the most nerve racking part of the painting. But it is all in the relationships. Watch the shapes and constantly compare the painting on the canvas to the actual set up. Check the angles against multiple points to ensure that it is right or at least very close to right. For instance, the reflections of the bananas. How does the reflection compare to the right side of the actual subject. The left side. The top of the bowl. The reflection of the table top. The reflections of the can of Crisco. Are the relationships and shapes correct or do they need to be modified. Constant questioning and evaluation and, at times, corrections. But it is worth the effort to get it right. Happy to report that this painting has also been accepted into the Raw and Cooked exhibition at The Next Picture Show August 2 – September 4, 2013. Finished in a single painting session (okay, it was a long session). A still life. Not my usual genre. But I had a reason, or should I say reasons. A competition deadline was looming. A regional competition offered the challenge to create works based upon the theme “Raw and Cooked”. My wife was in Chicago to attend to some doctor visits with her mother and it was rainy. Perfect time to tackle the challenge. I already had one work which would fill the bill, Pail by Comparison. I wanted to have four works for submission. Before my wife left, I discussed my ideas with her. Thank goodness. Out came all sorts of cooking and baking utensils and necessities. Plenty of good source material. Had fun with these apples. While applying the finishing touches to the apples I ran with an idea to put in a smear of Permanent Rose. Worked great.Happy to report that this work was accepted for the competition. The exhibition will be at The Next Picture Show in Dixon Illinois from August 2 – September 4, 2013.